Breakdown recovery experts The AA have released a mobile app to help motorists decipher dashboard warning lights. The app comes in response to a recent piece of research that showed one in eight drivers do not keep a manual in their car, while many others do not know what the warning lights mean or simply ignore them. The AA said that it deals with around 17,000 cases each month of drivers requiring help with warning lights. 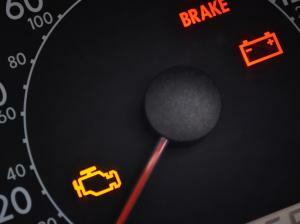 Many motorists consider taking their car to the garage when warning lights show up on their dashboard. Mechanics, covered by road risks insurance, are able to get behind the wheel and test drive the vehicles to assess the faults and make sure any repair work has been successful. However, the release of the new app will empower car owners to assess the problems with their own car - many warning lights can be easily remedied without having to go into garages and pay someone else to fix the issue. AA mechanic Max Holdstock explained: "We often find that used cars don't have a handbook and even if there is one, many drivers never look at it. The AA app is a quicker and smarter way for drivers to check what their warning lights mean. "Although most warning light symbols are standardised, many are not, and with some car dashboards resembling the Starship Enterprise, it's no wonder that some drivers are left bewildered."